Building on yesterday’s post about Hopeless Joe’s Shake Shack Adventure, this post was originally going to be about baseball’s longest hot dogs, perhaps a ranking of them. But it turns out that there is not much of a contest. It’s the 24-inch-long BOOMSTICK down in Texas — originally a tribute to Nelson Cruz, but it became so popular that they kept it even after Cruz was gone. (And the stadium’s concessionaire has brought it to other ballparks for trial runs.) It has even inspired a whole 24-inch-themed concession stand in the ballpark, where the Rangers have offered obscenely unhealthy items like the Murphadilla (after David Murphy), a 24-inch quesadilla, the Rossome Nacho (after Robbie Ross), a BOOMSTICK topped with nacho ingredients, and the Beltre Buster, a 2800-calorie, 1-pound hamburger. This year, they introduced the Choomongous, a two-foot-long Korean barbecue sandwich. Clearly, the Rangers believe that their stadium seats are well-constructed and will not collapse under the weight of their fans. 1. The ALEX RIOShootthat’sagiantpastramisandwich, a two-foot-long pastrami sandwich topped with mustard, sauerkraut, nachos, and sixteen crumbled up chocolate chip cookies. 2. The DAR-Fish Taco, a 24-inch fish taco, filled with an entire striped bass, two heads of cabbage (shredded), a field of radishes, and four pounds of vanilla soft-serve crema. 3. 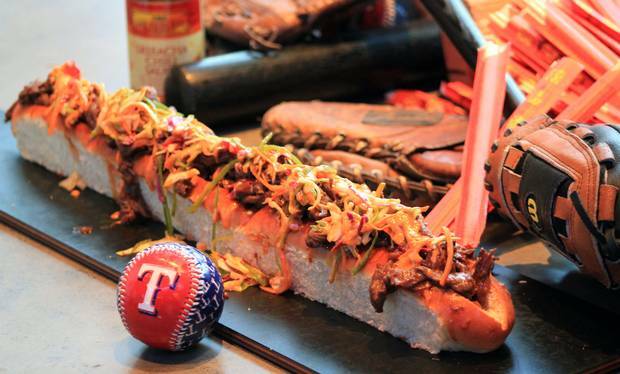 The Elvis (Andrus), a sandwich made of 24 bananas and thirteen pounds of peanut butter, served between two “records” made of chocolate Oreo cookies, and topped with a game-used home plate dipped in caramel. 4. The Prince Veal-der, a 24-inch veal parmesan hero, accompanied by a bucket of pasta and a wheelbarrow filled with extra tomato sauce for dipping. 5. The Colby Lewis, a gigantic grilled (colby) cheese sandwich, Scott Baker-ed in the oven until all melty. 6. The Mitch More, More, Moreland-and-sea, where two 24-ounce steaks serve as the “buns” for a lobster roll, made from two pounds of lobster meat, four fields worth of celery, and a Costco-sized jar of mayonnaise. 7. The Ron WashingTON-OF-FOOD, a garbage pail filled with whatever leftovers the stadium kitchens have on a given day, pulverized in a blender, and served with a straw (whipped cream topping optional). We hoped you liked reading The ALEX RIOShootthat’sagiantpastramisandwich by Jeremy Blachman! Tanner Scheppers Pie: a layer of arm meat topped with mashed ulnar collateral ligaments and served atop a herniated disk. Cheese optional.